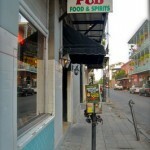 Although this bar is no longer open, the building still remains and it is the building, not the bar specifically that is said to be haunted by the ghosts of those who died and were tended to in the former morgue. 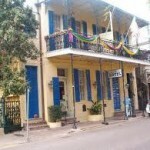 I recently stayed here for a week for Jazz Fest 2014. We heard dorbells ringing although a man who worked here told us he heard them as well but knew there were not any doorbells in this house. Me and twoo others who were staying here witnessed the bedroom door that leads into the room adjoining the upper balcony doorknob turning and then the door opening to around two feet. On two different occasions within 24 hrs. apart. The door it should be noted is not easy to open as it is heavy and a tight fitting one and the knob does not turn easily. Another guest that was staying there with us heard a little girl giggling beside his bed which is next to the same door. My other friend was sitting on the balcony with me when something brushed against her leg. We also had a diamond earing dissapear from throom upstairs only to be replaced in the middle of the floor in the small bathroom days later after we searched on hands and knees for a week for it. What’s in embalming fluid; a drink the bar made 10 years ago.